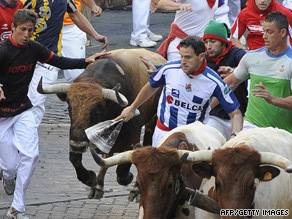 MADRID, Spain (CNN) -- A man died after being gored in the neck during the annual running of the bulls in Pamplona, Spain, the Navarra regional government said Friday on its Web site. Runners take part in the running of the bulls in Pamplona, Spain on July 9. The death would be the first in the running of the bulls since a 22-year-old American was gored to death in 1995. The latest victim was a Spanish man, Daniel Jimeno Romero, age 27, from the Madrid area who was vacationing in Pamplona with his family, CNN partner station CNN+ reported from the hospital, where authorities identified him. Amateur video footage showed the victim falling to the ground toward the end of race, just before the entrance to the bullring, and apparently being gored in the neck. Three other runners were gored and suffered less serious injuries on Friday, and six others went to the hospital with bruises or other injuries, the Navarra government said. Emergency workers and ambulances line the route to quickly attend those who fall. Do you think this tradition should be banned? The run in Pamplona started 400 years ago and became popular worldwide after author Ernest Hemingway wrote about it in the 1920s in his book "The Sun Also Rises," also published under the title "Fiesta." The event is held July 7-14. Six bulls and a pack of tame steers run from the corrals, through Pamplona's old town, to the bullring -- where the bulls will die later in the day in a bullfight. Including the recent death, 14 people have been killed in the runs since 1924, when record-keeping began.